The governance structure of the LCIP Platform needs to utilize several elements to fulfil all the functions of the platform. The Local Communities and Indigenous Peoples Platform (LCIP Platform) was established in Paris in 2015, but its operationalization is still ongoing. The LCIP Platform could provide an important next step towards a nuanced inclusion of specific non-Party stakeholders in the UNFCCC process. Based on the negotiation process for the Platform and on current modes of participation of non-Party stakeholders, this report develops a toolkit of governance elements for the Platform. 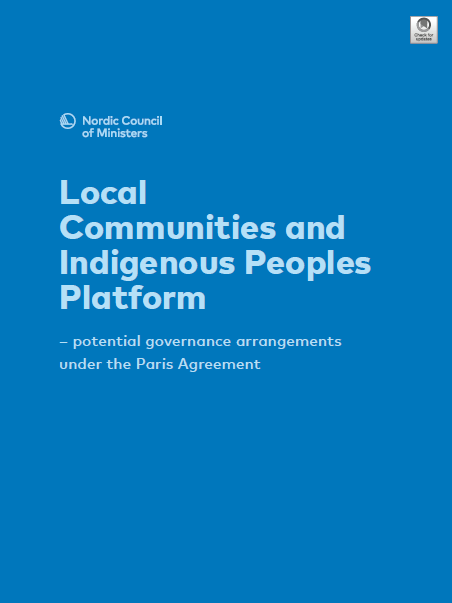 This toolkit can be used by parties, local communities, and indigenous peoples to discuss the implementation of the Platform's functions and potential combinations of governance elements more specifically. The report, written by Arne Riedel and Ralph Bodle, both of Ecologic Institute, is available for download. In the upcoming negotiations, Parties to the UNFCCC, local communities and indigenous peoples need further exchange on key questions on the platform, including its governance structure and a timeline for the process. Capacity building for engagement, including the capacities of local communities and indigenous peoples (LCIPs) in the UNFCCC process as well as the capacities of Parties and other relevant stakeholders to engage with the platform and LCIPs. Integration of knowledge systems, practices and innovations in climate change policies and actions, on the international as well as on the national level. A combination of several governance elements is more likely to fulfill the platform's functions sufficiently. Currently, the COP23 decision only gives a first indication of potential elements including a "facilitative working group." Should the Parties decide to establish such a group for the LCIP Platform, its setup and role within the platform could be designed in several ways. One possible option would put together an expert group on the international level to advise the UNFCCC process. Another option would set the group up as a steering committee for the platform’s work to be conducted in international and regional workshops. Also, options without a group structure could still be debated, including a dialogue platform with co-chairs on the international level. Important aspects of the operationalization that still need to be decided are the timeline, including the question if all governance elements need to be set up at the same time, and a potential review of the platform. Riedel, Arne and Ralph Bodle 2018: Local Communities and Indigenous Peoples Platform – potential governance arrangements under the Paris Agreement. Nordic Council of Ministers: Copenhagen.